There’s no doubt that Lotus Notes customers are nervous, after IBM’s announcement, regarding the sale of the software. On the other side, this is the best moment for them to reconsider their options and see if it’s time for a change. Last month, IBM revealed that everything that’s left of Lotus – including Lotus Notes, Domino, and Portal – will be sold to India-based company HCL technologies, in a deal worth $1.8 billion. 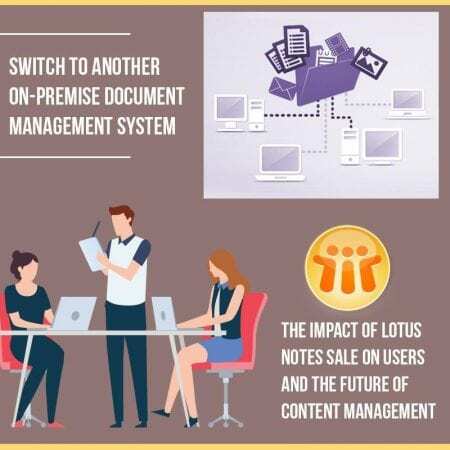 And the reason behind their decision was rather simple: even with some big investments, platforms like Lotus Notes will still lack a lot of the features that are nowadays present in modern enterprise content management systems, as well as content services platforms. However, it’s worth mentioning that Lotus Notes, for example, was designed in a different era, so the only way to compete with the functionality of newer enterprise content management systems or content services platforms would’ve been to come with something completely new, but use the same name. Still, this requires big investments, which can be intimidating, even for successful companies. Ok, so what’s next for users? Technically, there is some good news! It appears that HCL Technologies is planning to invest into Lotus Notes more than IBM did, as soon as some of its biggest issues will be solved. In this case, users who remain faithful have a limited number of options at the moment. It is still unknown what are HCL Technologies’ exact plans for Lotus Notes, but they will definitely put some money into it. In this case, users can choose to stick it out. Sure, there will be some bumps along the road, but there’s no way HCL will abandon the project. At the moment, since there is no backing from IBM, a lot of developers might feel like abandoning everything, creating a sizeable maintenance risk, but we can’t say that this was unexpected. If you’ve been using Notes for some time but don’t trust HCL’s abilities to take over the management, it’s obvious that you will start looking for another option. And this is what a lot of people will probably do, as they will want a newer and more modern on-premise document management system. Sure, this can be a big undertaking, as it presumes migrating files. Still, it will also help minimize any disruptions or service gaps, not to mention that it can provide additional capabilities that the ones currently available with Lotus Notes. Considering that cloud-based content services platforms, as well as ECMs are very easy to adopt, thanks to the significant advances in cloud software technology and infrastructure, this can be a viable solution for any Lotus Notes users. Still, before doing this, they need to make sure that their platform of choice can meet the same requirements. The differences between most cloud-based ECMs and Lotus Notes are significant, so long-time users can even have a shock at first. On the other side, they have significantly smaller infrastructure requirements, not to mention that they are cheaper to implement. To wrap it up, after IBM’s sale of Notes, a lot of users will consider enterprise software options, as well as their long-term content management strategies. On the other side, if you decide to stick to it, you can always use professional help, no matter what kind of service you need. Since 1996, IB Systems has been an IBM Business Partners, able to provide custom apps for any business, as well as administration or support for Lotus Notes and Domino. Whatever you need, their experience allows them to help! Next PostNext Gmail vs Outlook – What Should I Use?